My Fridays all seem to be running together these days. 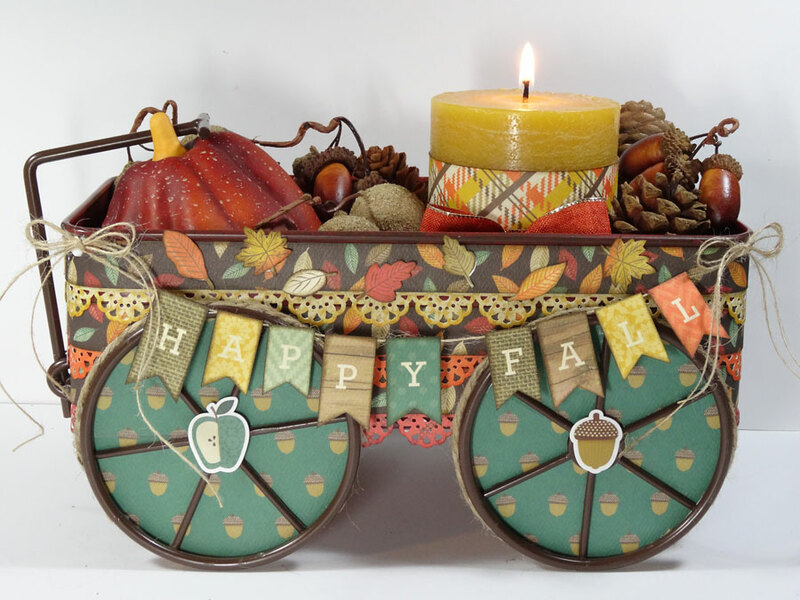 It's been a busy, busy month here in my craft studio. 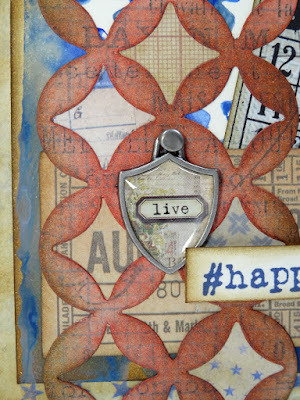 I've been designing my little heart out! 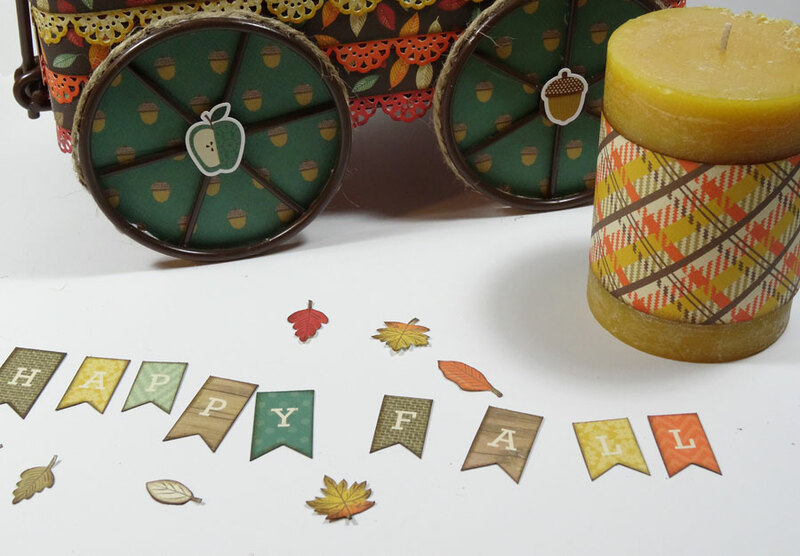 Three projects for Graphic 45's Fall season of events and a few special cards for the upcoming Clearsnap catalog. Not to mention my own class projects and a few other fun things brewing. Whew! 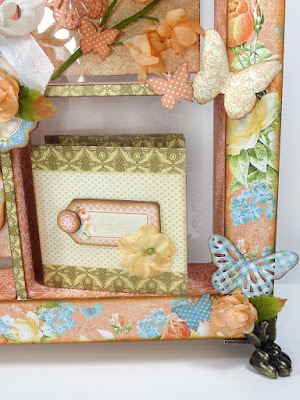 Because of all this fun creating, I wasn't able to create a "Just For Fun Friday" project this week. 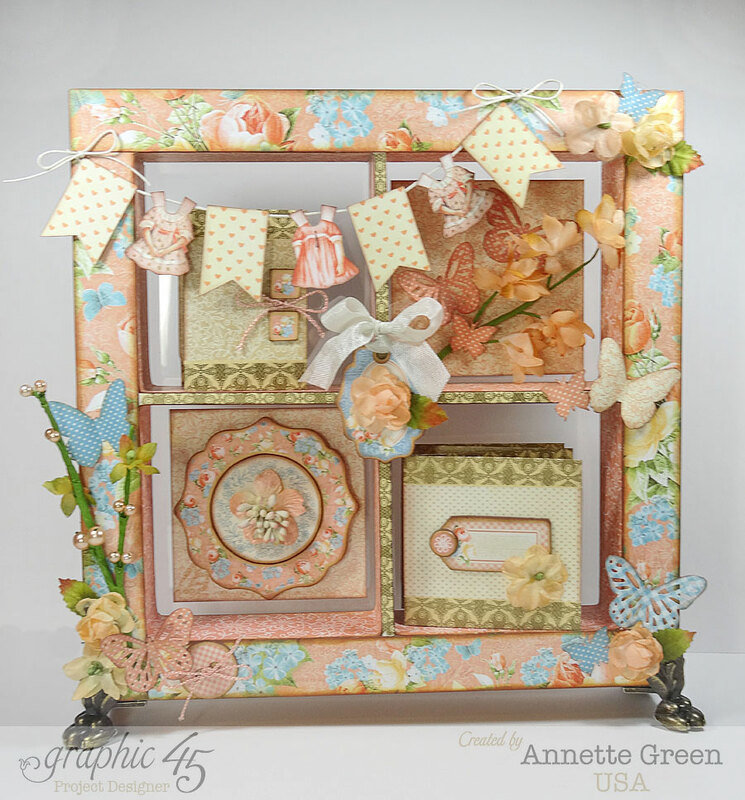 What I CAN share is a fun project I designed this past Spring using Graphic 45's Precious Memories collection and the Ivory Shadow Box. 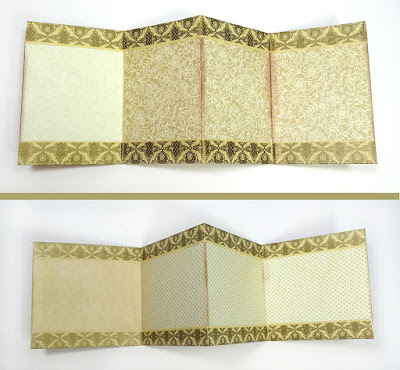 This comes with a printable project sheet so you can make your own. Simply click here. Just for something a little different, I thought it would be fun to share what goes into designing these special projects for Graphic 45 as I share the photos of this particular project. The first step is a conference call with Charee Filimoehala, Graphic 45's Design Team coordinator. 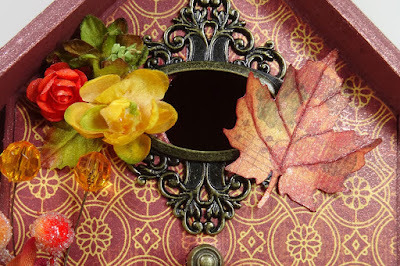 I make note of the time we begin and finish talking, plus all the hours logged along the creation process. 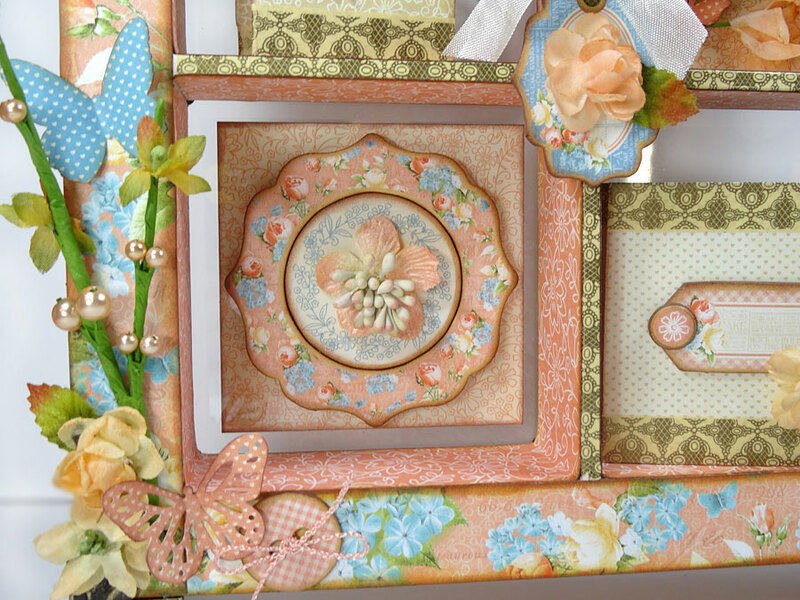 Charee gives me the basic plan: which collection they want me to use, what major product they want to feature (in this case the Ivory Shadow Box), any other materials they want me to use, how long they have to teach the class, and a materials budget. 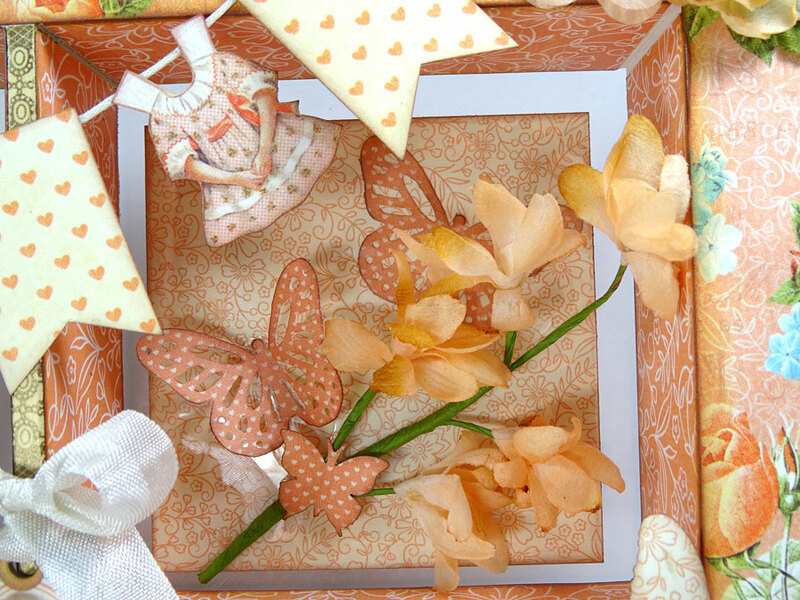 They usually have a general idea of what they'd like to see (for example, in this project they wanted me to use Precious Memories and the Shadow Box, but wanted to focus less on the baby imagery and make it more universal.) 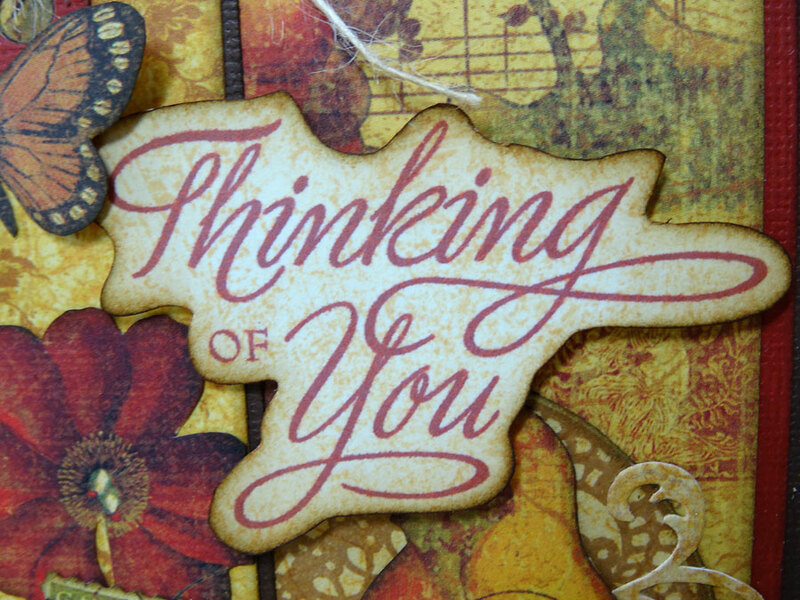 Oftentimes, we share a secret Pinterest Board where we pin ideas and inspiration. Based on all this, it's time for me to create. 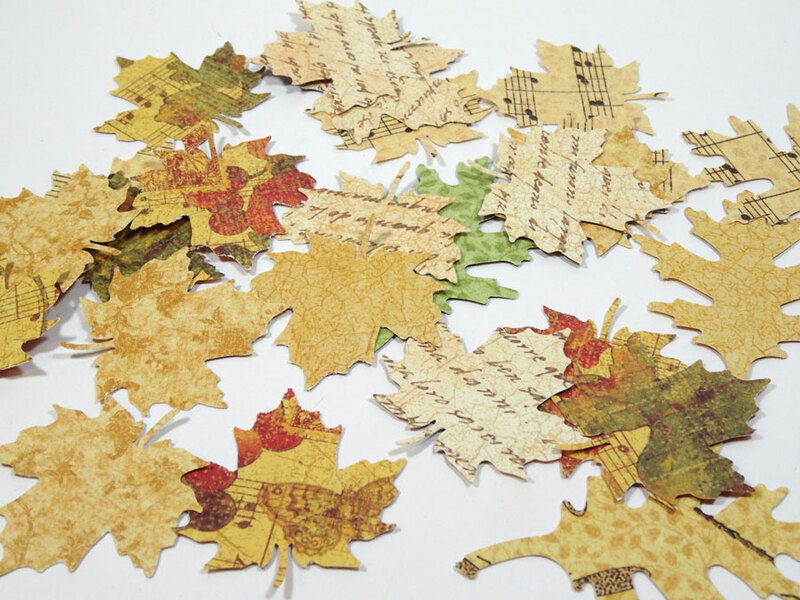 The design process involves keeping track of the number of papers used and the cuts per sheet. I use repositionable adhesive for everything at this stage, in case I have to move things around or change things altogether. I take preliminary photos along the way and once I've finished the design process, I upload these to my Google Drive folder which is shared with Graphic 45. At this time, Charee and Aimee look over the photos and discuss, then give me their feedback. I make any necessary changes, then upload more preliminary photos for final approval. Once I've been given the final okay, I set up my camera and lighting and take the project apart and start adhering everything with permanent adhesive, taking step-by-step photos along the way. After I've gotten the project reassembled and all photos taken, I go back into my Drive folder and type the supply list for Graphic 45. They use this list to gather the materials needed for the number of attendees in each of their scheduled classes. Sometimes it's 100 to 150 people, sometimes it's 40. Next I pull each photo into PhotoShop Elements to retouch and crop them. These photos will be used in the Project Sheets Graphic 45 puts together and provides to shop owners and eventually to the public, just like this one you see today. Graphic 45 has a tab in the sidebar of their blog where you can find all their Project Sheets! Lots of great projects you can create yourself. Once the photos are ready, I upload them into my Drive folder, named and numbered to keep things organized and easy to search online. Then I type the step-by-step directions to coincide with my photos. Graphic 45 uses these to teach their classes, so careful editing and re-checking are essential (and usually require my teenager's assistance). After the cutting guide is done, I print a copy and then cut a sample kit for Graphic 45. This is a good time for me to double check my measures and catch any mistakes. I place the pieces into individually marked zip-top bags to keep things organized and easy to follow. 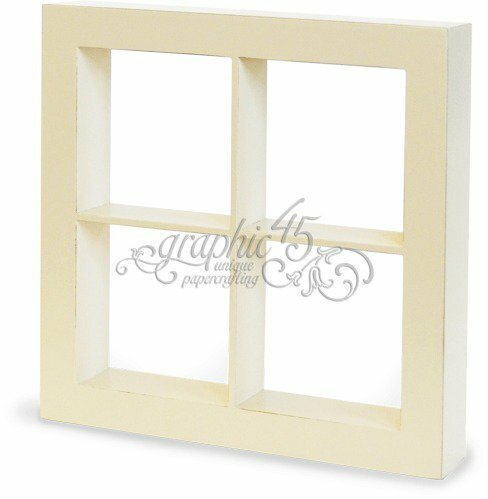 The final stage of the process is to carefully package the finished project and the sample kit, and ship it to Graphic 45. Once I know the package has arrived in Portland, I tally up my hours and send then an invoice for the job. 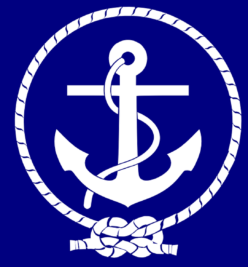 These class projects are usually on the intermediate level. Sometimes I'd like to add more, but this is where the customer can take over, if they wish. 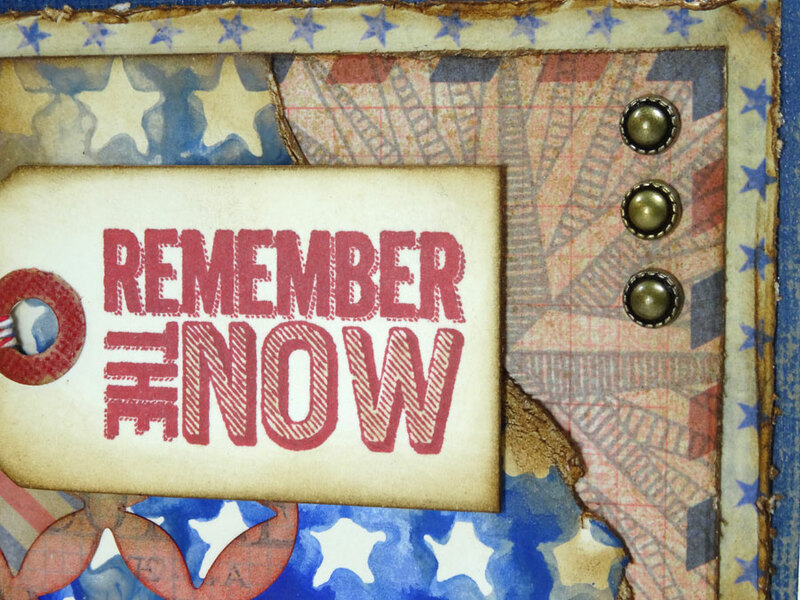 My job is to create a teachable, fun project that showcases the AMAZINGLY wonderful Graphic 45 line. I can't think of a better job. Can you? I'm one lucky girl. 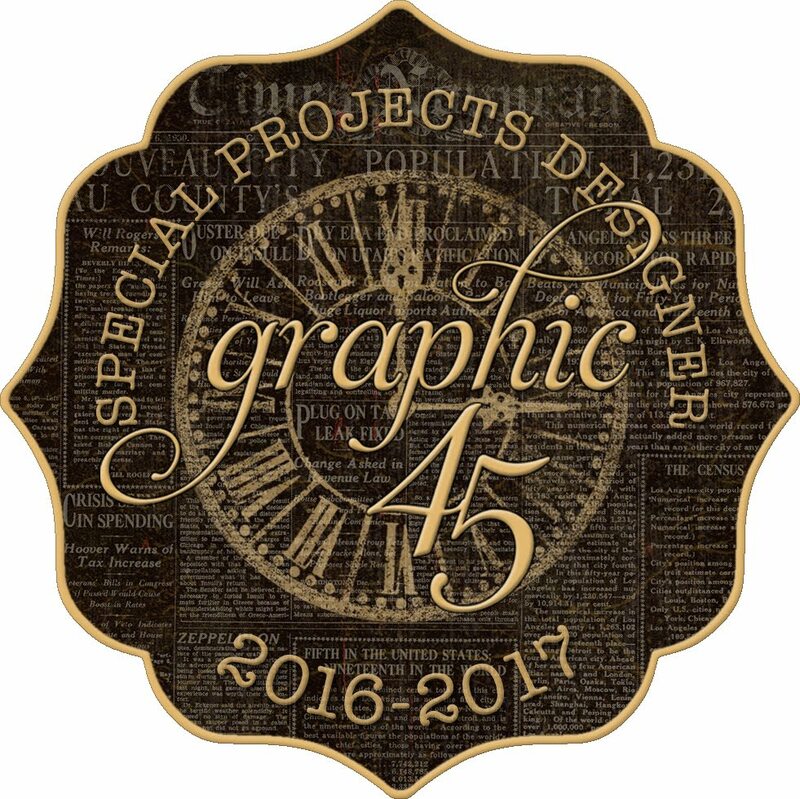 And I'm honored to have Graphic 45 put their faith in me project after project. Thanks for stopping in today. Now it's back to my studio to finish a fun Halloween project in the works. Have a great day! 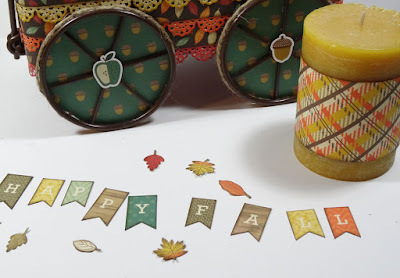 I've been a big fan of Carta Bella paper for a while now, and I recently discovered their Fall Blessings Project Challenge on Facebook so I thought I'd take a shot at it. 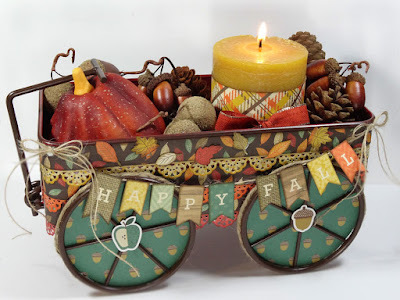 I've really been into Fall home decor projects lately and next weekend I'll be decorating my home for the season, so I went through my stash of alterables once again, remembering I had purchased a metal wagon on clearance this past Spring. Here's what it looked like from the craft store. It was 60% off! One of my favorite things to do is grab a big Starbucks coffee and wander the aisles of my local Hobby Lobby. 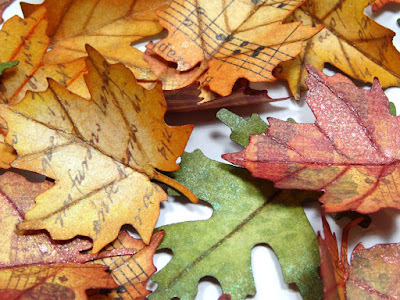 Not only are there great deals and wonderful choices, there's inspiration everywhere! 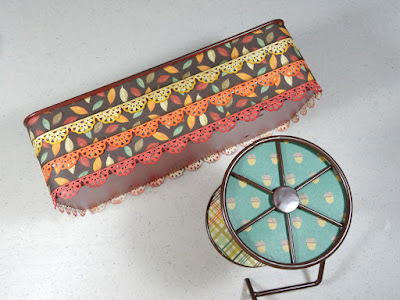 Here's how it looked after I altered it with Carta Bella's Fall Blessings paper collection. Fun, eh? It didn't take much time at all to alter it. Let me take you through a few steps. 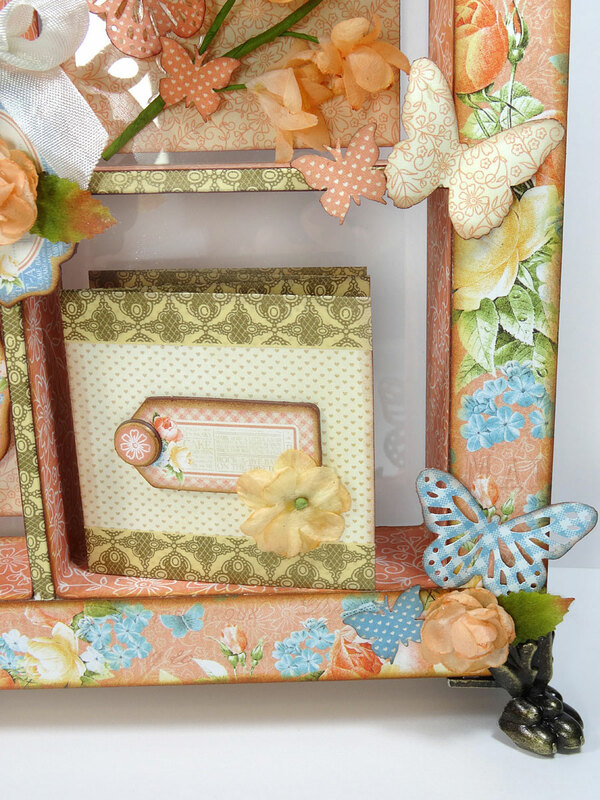 I started by cutting strips, punching some borders on some and then layering them together. 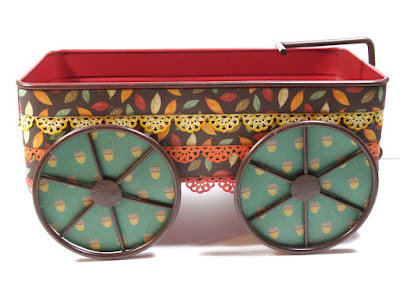 I removed the wheels to make it easier to work with and then I adhered the strips to the wagon with double-sided sticky tape and put 4-inch circles of paper behind each wheel with a few dots of tacky glue. 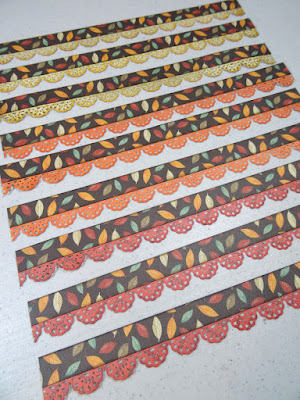 ...then I fussy cut the Happy Fall banner pieces and few leaves. I wrapped more of the paper around a candle and eventually tied a ribbon around it too. 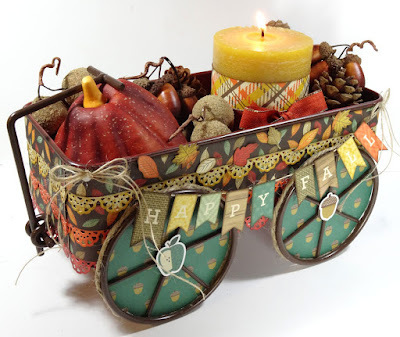 I filled my wagon with Fall sprigs, pinecones, acorns, a pumpkin and my candle. Not sure if I'll keep the stickers on the wheels or not just yet. They're cute, for sure though. 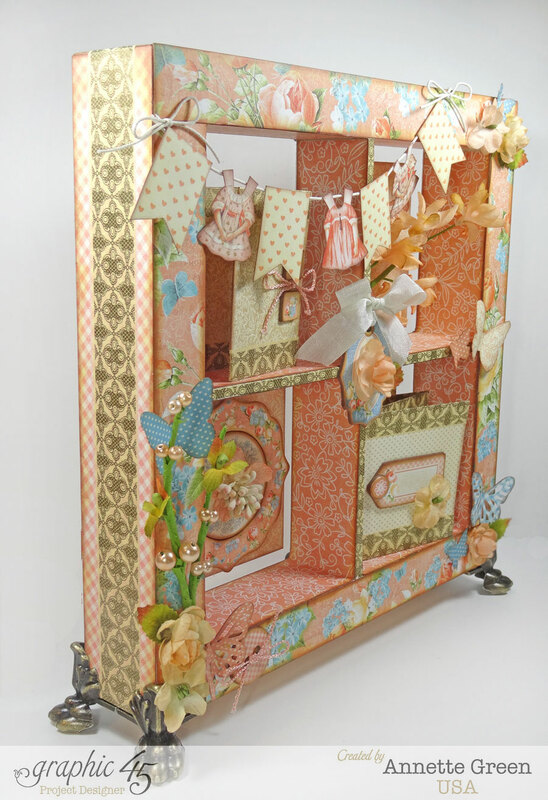 Make sure you pop over and LIKE the Carta Bella Facebook page and check out their challenges and new releases. Their paper is so fun to work with. It has great body and texture and the imagery is always fantastic! Thanks for stopping in today. I'll let you know if I win the Project Challenge. They're picking three winners on Monday, August 24th. Hello everyone. It's another Just For Fun Friday and I've got a home decor piece to share with you. 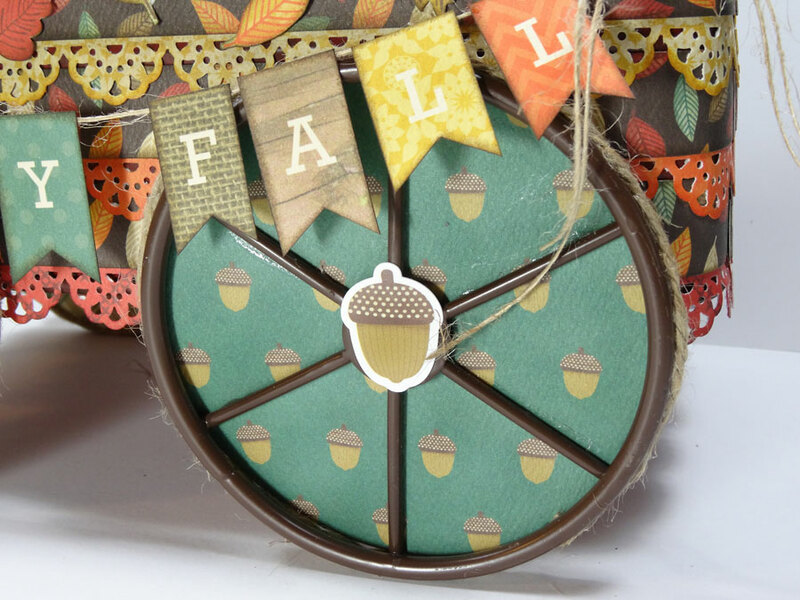 After I made my Graphic 45 Botanicabella card in my last post, my husband said it looked like a pretty Fall card. That's when I decided to create a Fall birdhouse. Even though it's still super hot here in Florida, and humid as can be, I can't help wishing for cooler temperatures and falling leaves. 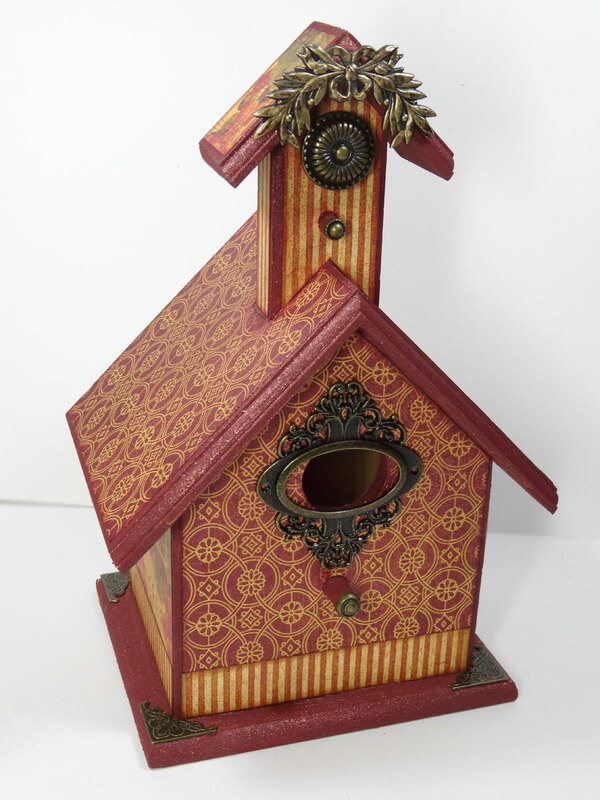 And I have this thing about birdhouses. I have one for every season now, I think. 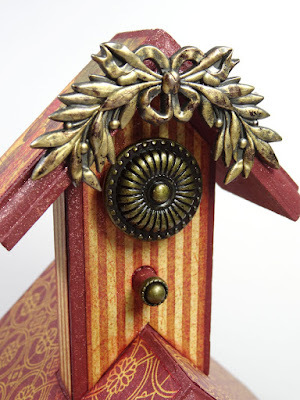 All you have to do is type "Birdhouse" in my blog search and you'll see for yourself. I love them! 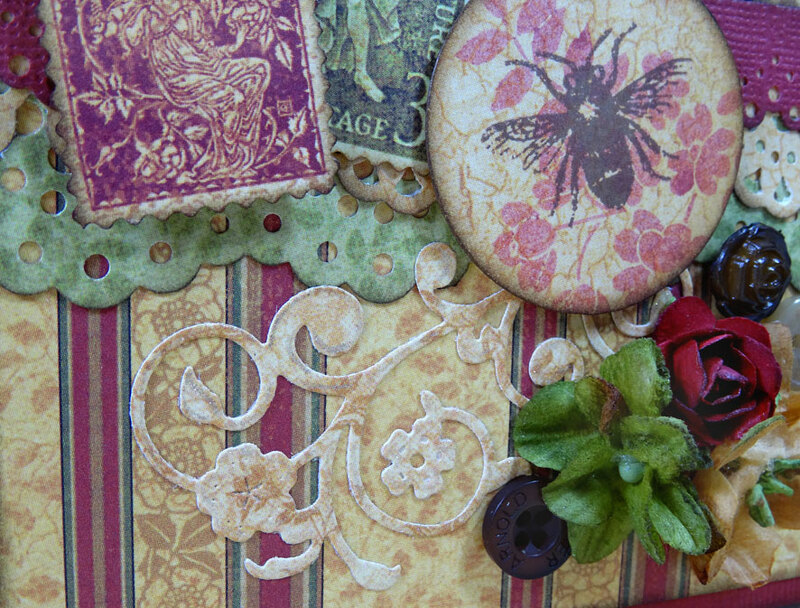 So, once again I grabbed the beautiful Botanibella collection from Graphic 45 and got going. 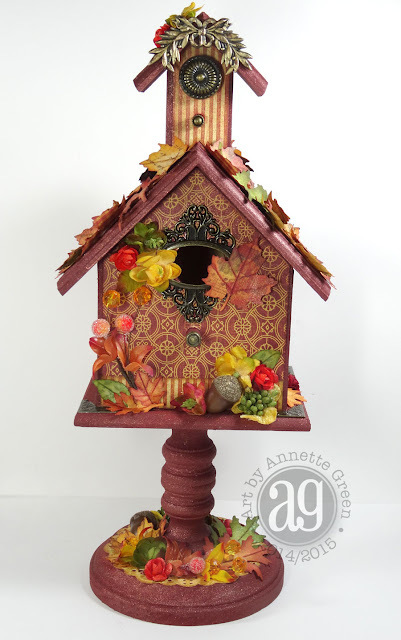 My finished birdhouse measures about 13" high, and is covered with Botanicabella papers, Petaloo flowers, Tim Holtz's Idea-ology findings, and a few more embellishments. 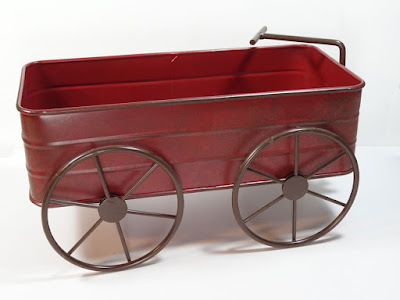 Let me take you through my process and share a few tips when altering wooden items. I started with these wooden pieces, all of which were in my stash. When wood crafts go on sale at my local craft store, I tend to grab a few things whether I have a plan for them yet or not. 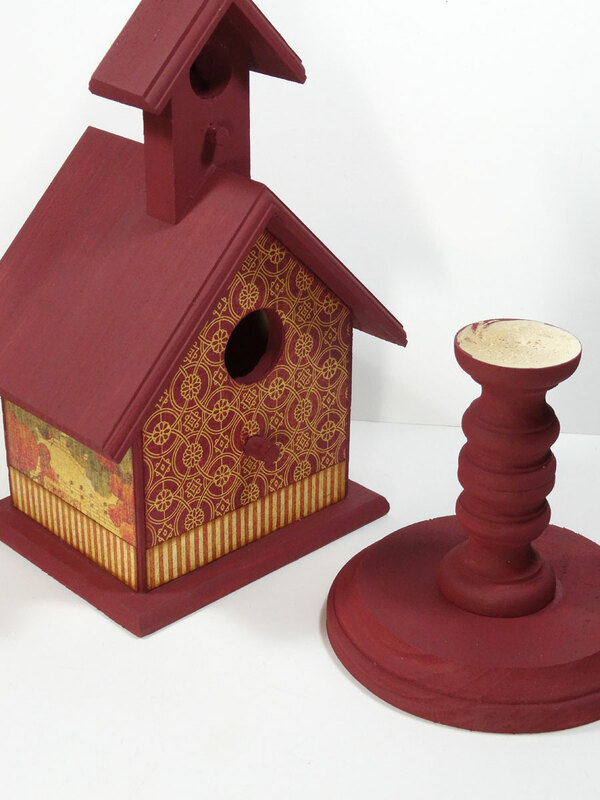 I've had this birdhouse for about a year now. I also give the rough areas a gentle sanding to make sure all is smooth. 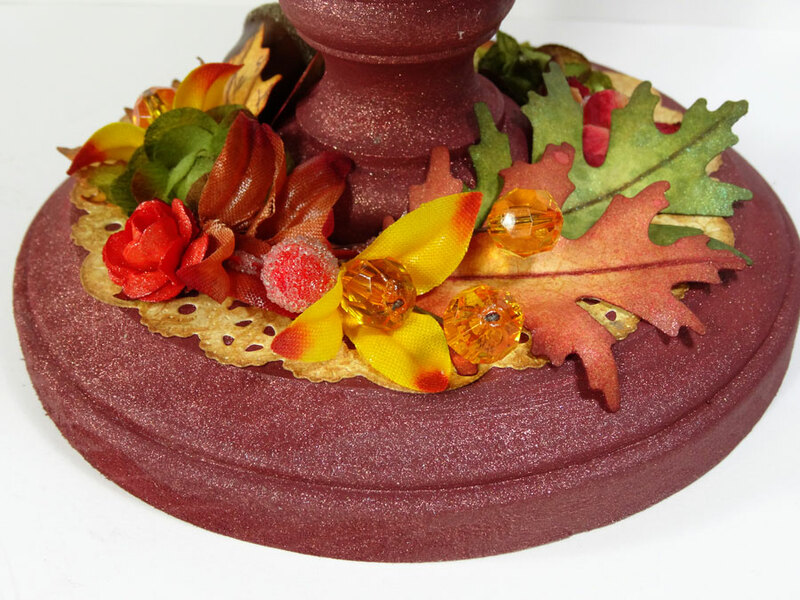 I painted my pieces with Americana Rockwood Red acrylic paint and glued the two candle stands together with wood glue. 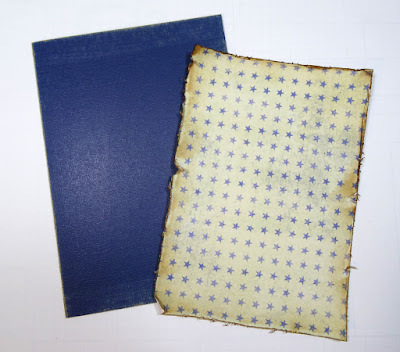 I always use this technique when covering wooden items: I make a paper template from recycled printer paper, testing where the holes will go and to check the fit. And in the case of a large hole or space like my birdhouse, I lay the paper on the wooden surface then do a pencil rubbing to locate the exact area of the hole. 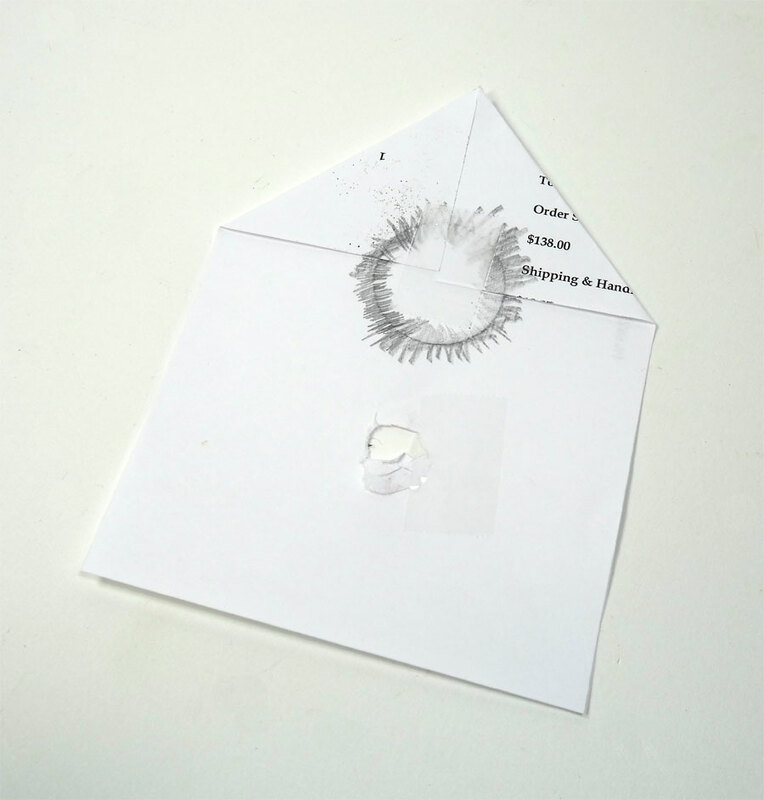 By scribbling, I reveal the outline of the hole. See it? 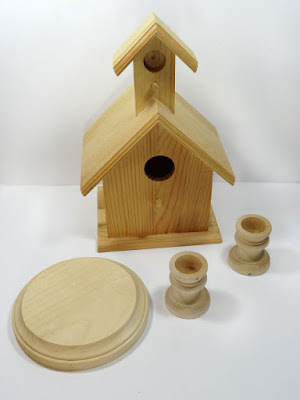 Then I can cut it out with a craft knife and lay it on my birdhouse again to check the fit. 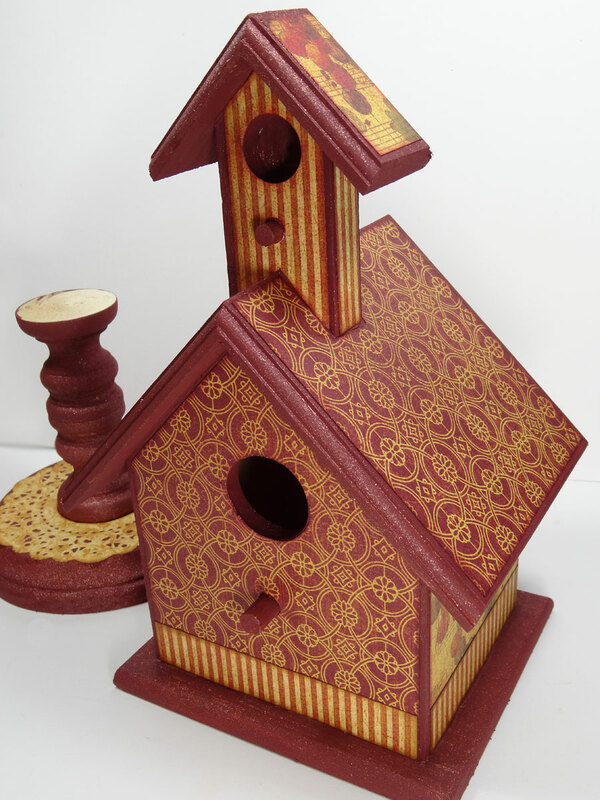 If my paper template is good, then I trace it onto the actual paper I want to cover the birdhouse with. I inked the edges with Aged Mahogany Distress Ink on a blending tool. 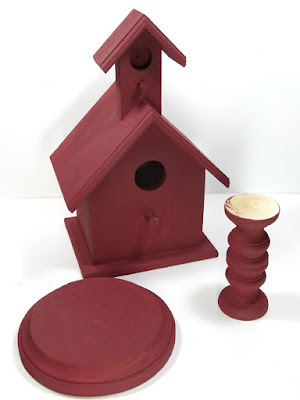 I glued my stand to my base with wood glue, and while it dried I adhered some papers to my birdhouse. I used two (very old) paper punches to punch a maple and an oak leaf from the Botanicabella papers. To make the leaves look more dimensional, I inked the outer edges and pressed some vein lines into each with a scoring stylus. After folding on the scores, I inked on those folds too. Big difference, right? 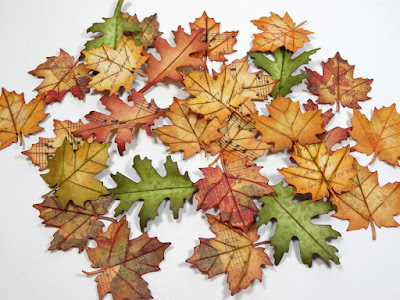 My leaves looked pretty good, but I wanted a bit more shimmer and drama, so I grabbed a few Perfect Pearls mists and gave them a light spritz. Here you can see a bit of that shimmer. 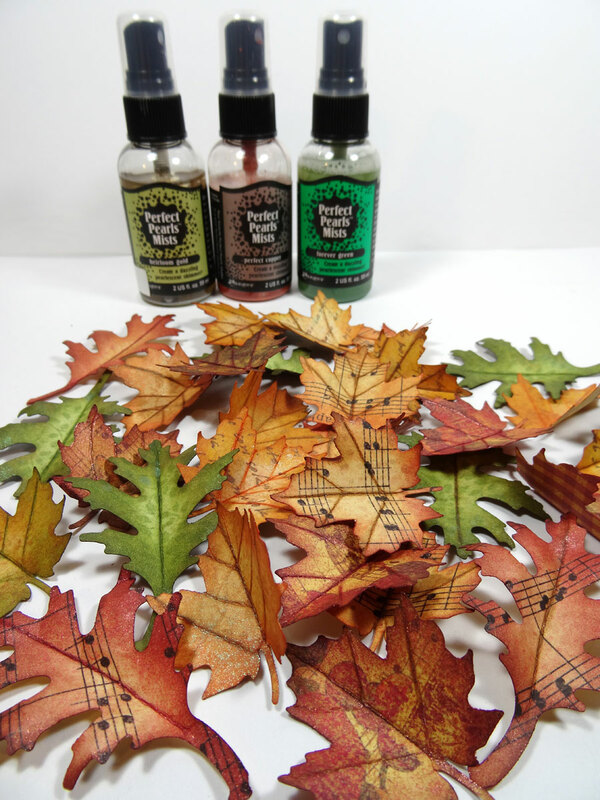 My favorite combination was spraying Forever Green onto some of the red and orange leaves. It gave such a natural look! I also used Perfect Copper and Heirloom Gold on other leaves. I used my favorite French Pastry doily die from Cherry Lynn Designs to cut this 4" doily from one of the Botanicabella papers, then cut a circle from the center for my stand to go. 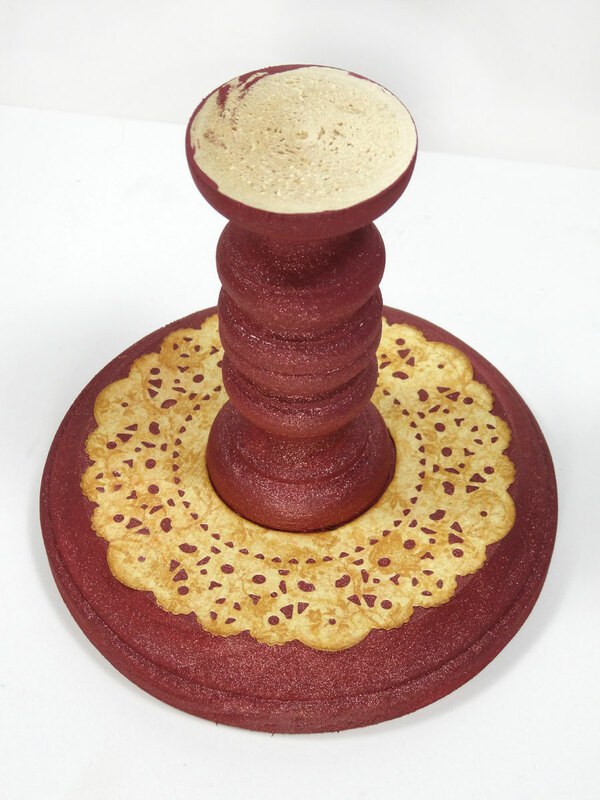 I slid the doily over the stand and adhered it to my base. Why did I cut away that hole? If I hadn't, my stand wouldn't be as sturdy. This way, wood is glued to wood. You may notice a bit of shimmer on the stand and base. I decided to spritz everything with more of the Perfect Copper spray. As I waited for the wood glue to set completely, I covered more of my birdhouse with papers using the same pencil rubbing technique described earlier. After all the paper were on, I sprayed the main birdhouse with the Perfect Copper spray too. I laid the birdhouse on its back to adhere several metal adornments to my birdhouse using E6000 for a strong hold. Once those were completely set, I stood the house up again and adhered the pretty metal photo corners. (I'm pretty sure I got those at Hobby Lobby). 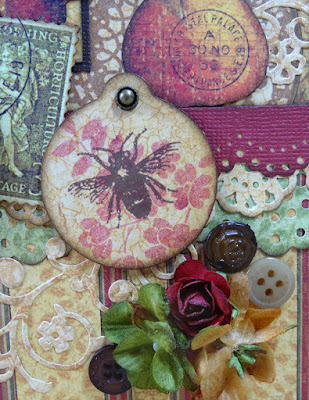 The laurel at the top is from Tim Holtz's Idea-ology "Nature Adornments." I gave it a hit of some Gold Mixative and Mushroom alcohol inks to mimic the look of the other metal findings. The brass button is from a mixture I found at Hobby Lobby, and the little Artisan Stud is from Close To My Heart. 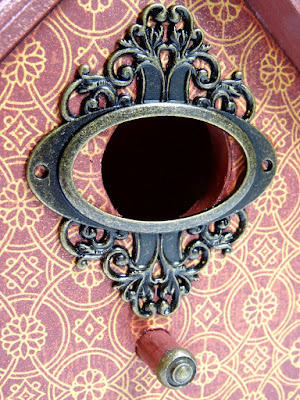 I adhered an Ornate Plate over the largest hole in the birdhouse which you can see is oval and not a great fit for the round hole. But don't worry, there's an easy fix coming up. I pulled the prongs off a Graphic 45 metal brad and adhered the head to the perch below the hole. To cover the mis-matched hole, I simply adhered some overlapping leaves and flowers. Easy enough, right? I had some leftover leaves and some pretty Fall stems, so I decorated the base of my birdhouse, using hot glue to adhere everything securely. 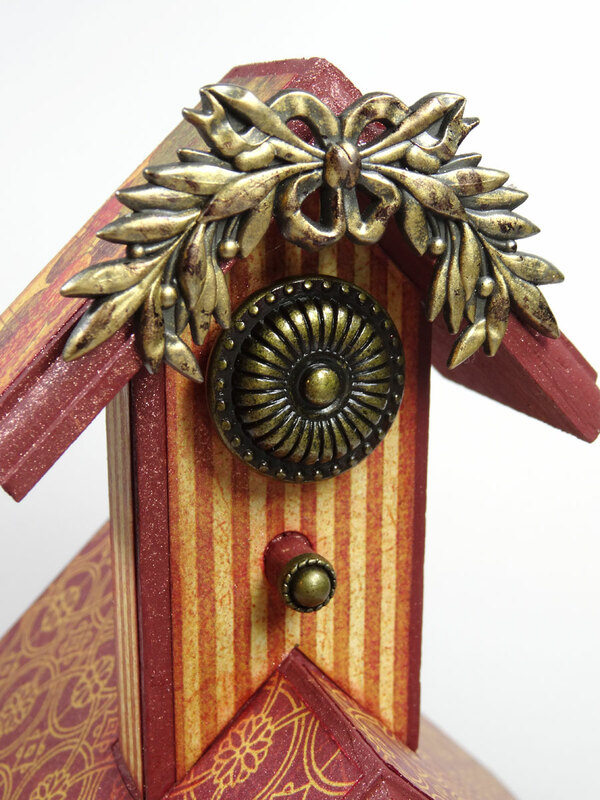 After adorning the front of the birdhouse with more flowers and leaves, I adhered the house to the stand. 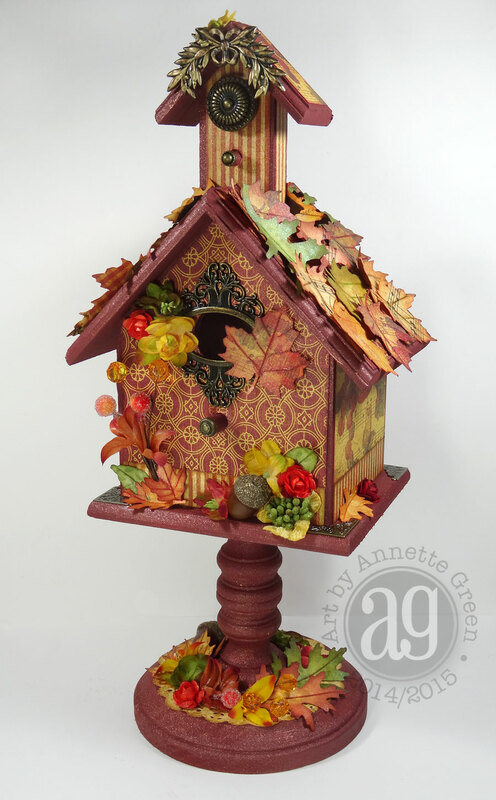 And my Fall birdhouse is complete. 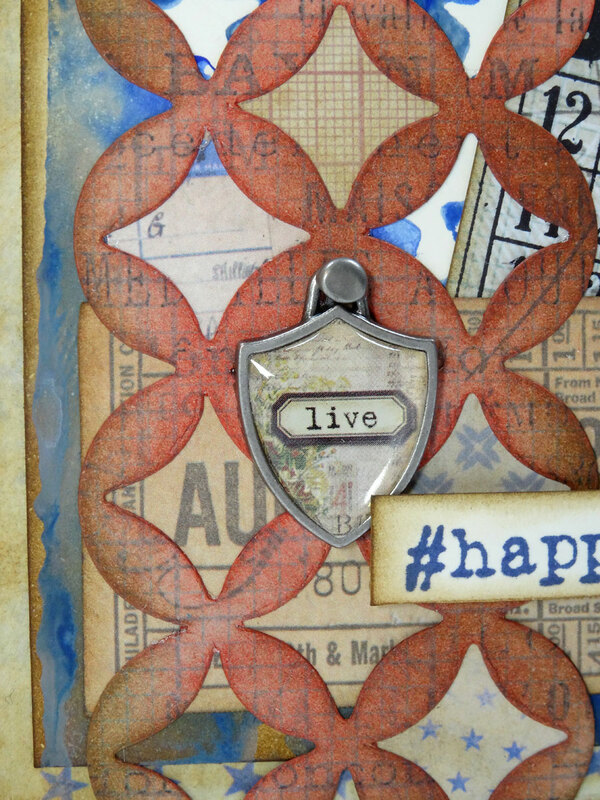 Thanks for joining me for another Just For Fun Friday. I'd love to know if you like altering wood or other items? What are your favorite papers to use? Do you have any tricks or tips up your sleeve when altering items? We'd love to hear! Thanks again for stopping in. Have a wonderful weekend! Hello and happy Friday everyone. 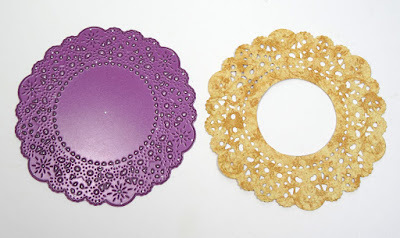 I'm starting something new here on the blog. How about a "Just For Fun Friday" post? I'm constantly making something around here, and even though most of the time it's work-related, sometimes it's "just for fun." So I will be reserving my Fridays (as often as possible) for projects I'm making "just for fun." 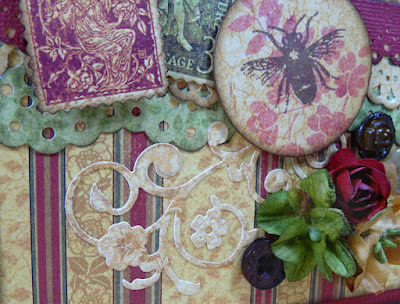 Today it's a card I created with the gorgeous Graphic 45 Deluxe Collector's Edition of Botanicabella soon to be released. Originally released back in 2008, it's back and as beautiful as ever! Here are a few photos to share below AND I've included a handy Snapguide if you feel like making one yourself. In the tutorial, you'll see what supplies I've used as well. Enjoy, and let me know what you think. Thanks! Check out How to Create a Lovely Layered Card for Any Occasion by Annette Green on Snapguide. Hi everyone, and boo-hoo! We've come to the last challenge in the Compendium of Curiosities III. I can't believe it still. It went so fast. Okay, back to the final challenge. 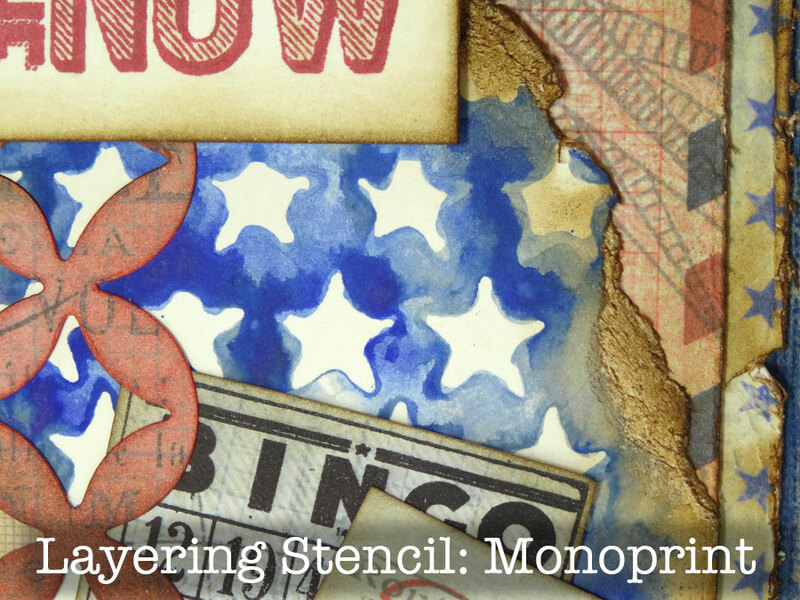 It's called Layering Stencil: Monoprint and can be found on page 48 in the book. 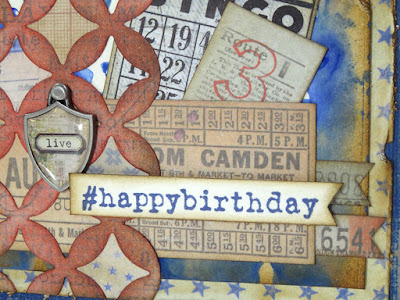 I created a masculine birthday card because, well, I have SO many handmade cards in a nice display rack and would you believe I didn't have a single masculine card in there?! 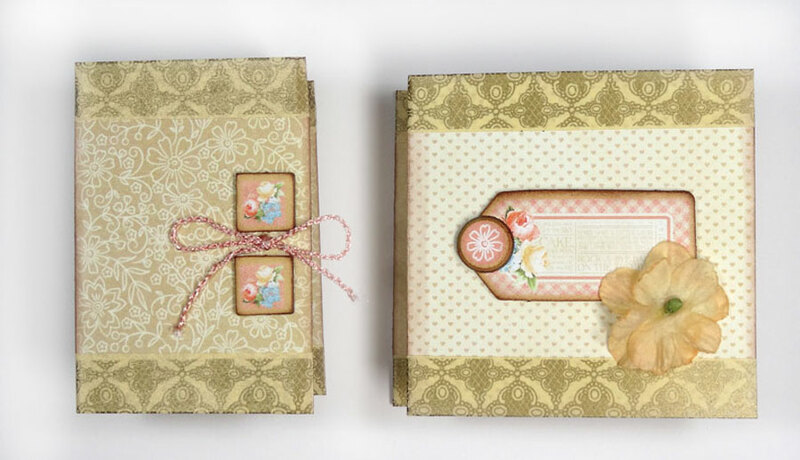 My card measures 5" x 7" and features the Correspondence paper stash. This and Wallflower are my two all-time favorites from Tim. I go to them all the time. 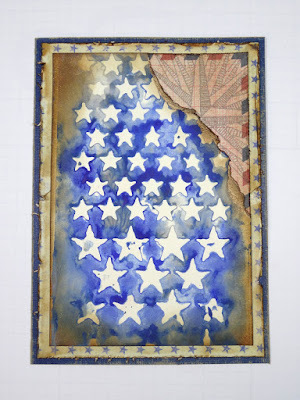 I cut a piece of Mixed Media Cardstock to do the Monoprint technique and used the Stars stencil. 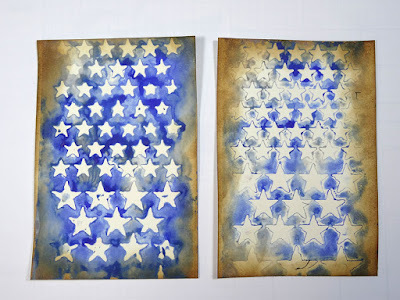 On the left is the actual technique and on the right – rather than waste all that paint – I grabbed another piece of cardstock and pressed the stencil down on it. Great effect, just a bit lighter. I'll be saving this one for another project for sure. I love how it turned out. And by the way, I used the two newest Distress Paint colors: Blueprint Sketch and Hickory Smoke. Both were distressed with Vintage Photo ink. I cut my card base from dark blue Kraft Core cardstock and sanded the outer edges. Then cut the star paper from the Correspondence stash and distressed the edges. 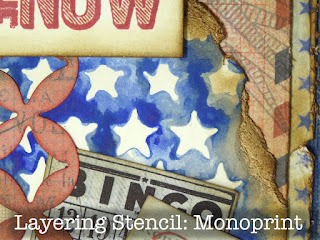 One of my favorite things to do to pattern paper is spray it with Antique Linen Distress Stain to instantly antique it. Check out the next photo to compare that same star paper in the back of the pile. See the bright white background? 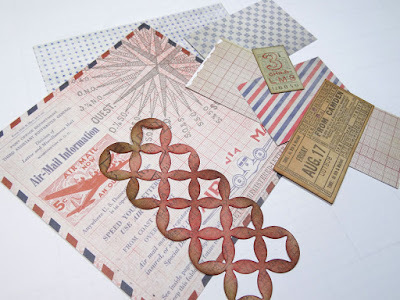 Then I gathered several papers in the stash. 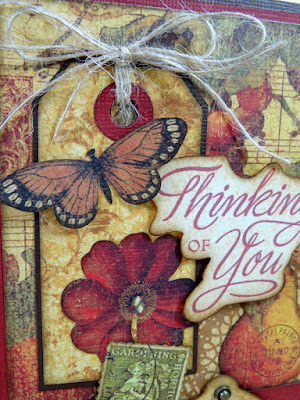 I cut one of the papers with the Courtyard On The Edge die and blended some Fired Brick Distress Ink over the top. 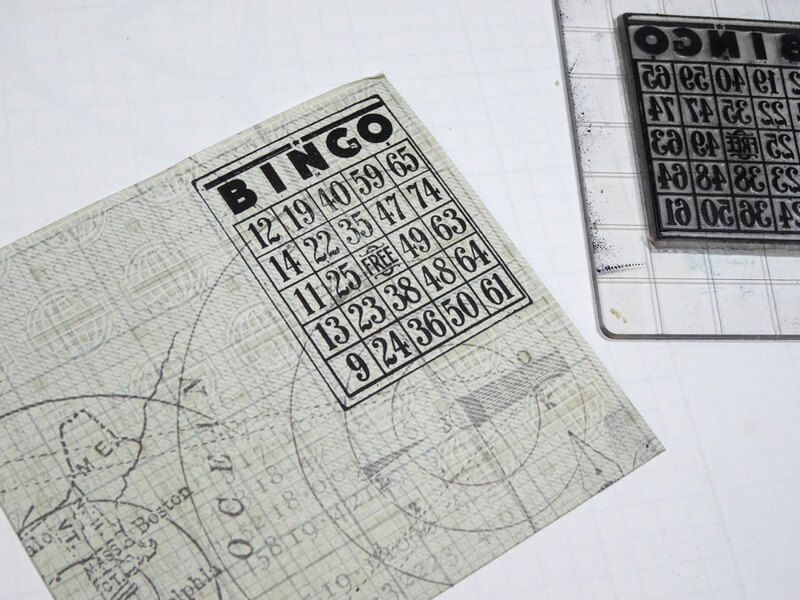 I stamped this Bingo image with black archival ink. 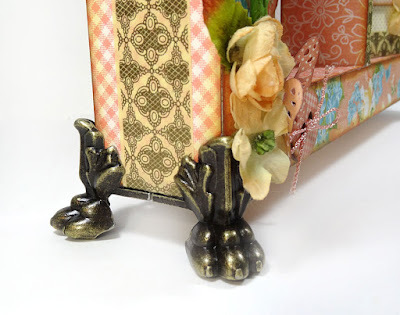 It's from an older Stampers Anonymous clear cling stamp set called Playful Journey from my local Michaels store years ago, . I gave my technique piece a rough tear across the top right corner and inked the edges with Walnut Stain, then starting building my card. 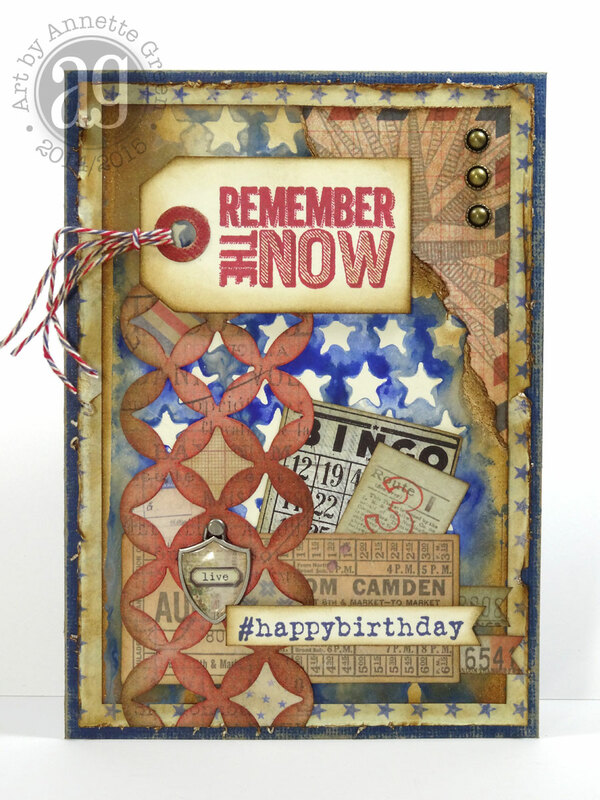 Here's another look at the finished card. I got so caught up in putting it together, I just stopped taking photos. Doh! 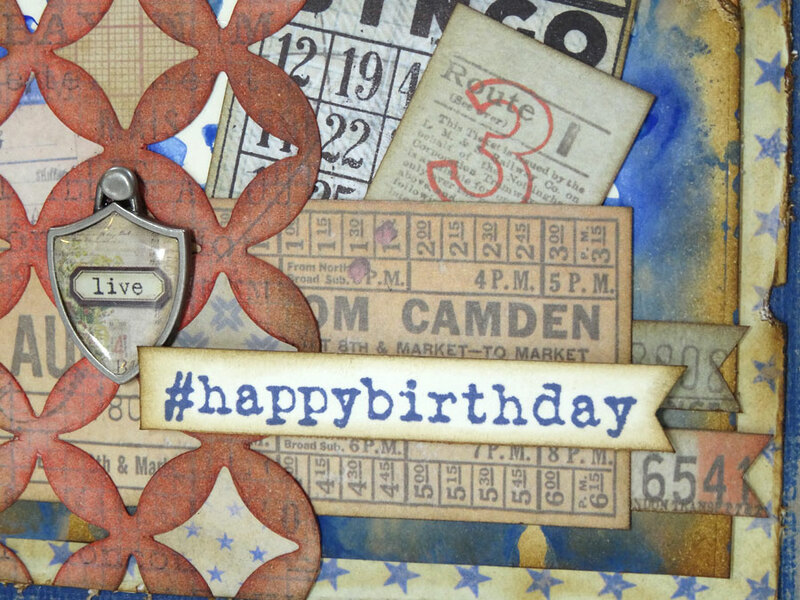 Here are some close-ups below of the finished card. 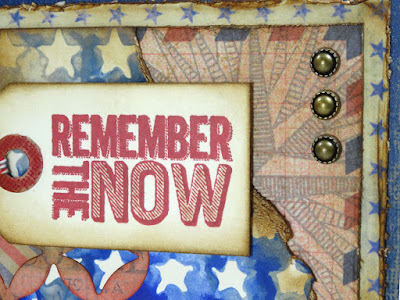 I stamped Remember The Now from the Mercantile stamp set with Red Geranium Archival ink onto a tiny tag and popped three Artisan Studs in the corner. 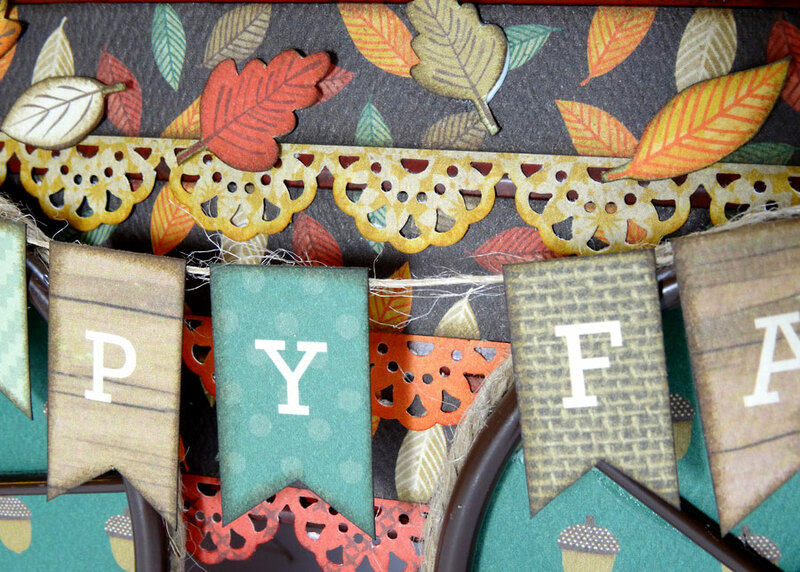 I love these adhesive-back embellishments. I hoard them! 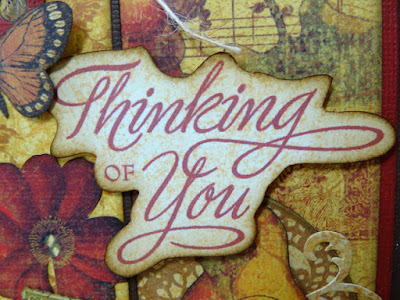 They are from Close To My Heart, and they come in brass and pewter in two different sizes. I used the Hashtags stamp for the Happy Birthday wish. 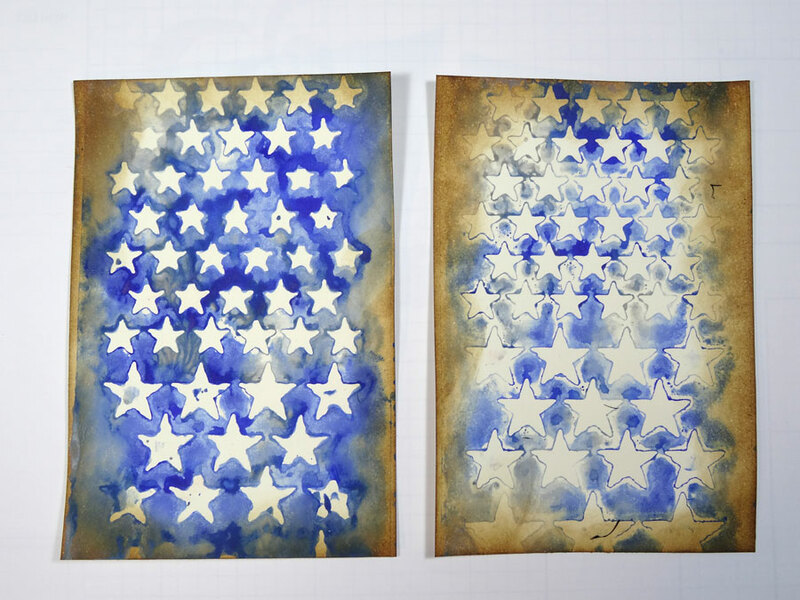 Stamped in Blueprint Sketch ink. 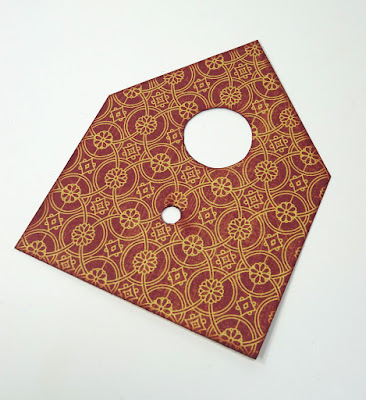 I punched various 7/8" circles from a variety of papers in the stash to place behind random openings in the Courtyard die-cut. Finally, I added a Shield Charm to reinforce the message. 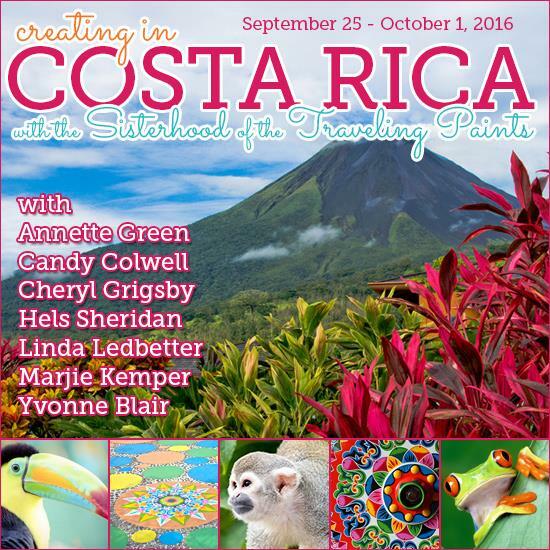 Even though the Compendium Challenges will soon be over, The Sisterhood of the Traveling Paints will be planning, plotting and creating, of course! 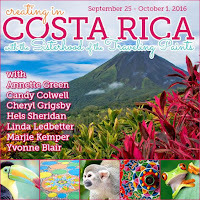 We hope you'll stay tuned September 1st for some special news about what we'll be up to next, leading up to next year's fantastic creative get-away in Costa Rica. In the meantime, please join us in the final Compendium Challenge. Let's go out with a BIG bang!